Manager John Gregory has been meeting the players whose contracts expire at the end of the season. The following players have been offered new contracts and have until the end of May to accept or decline their offers. The following scholars have already signed one-year contracts for the 2014-15 season. The following players are already under contract for next season. New contracts have not been offered to the following players. John said: “Telling players they haven’t been offered a new contract is one of the hardest aspects of management and it does not get any easier over time, believe me. “We will have a competitive playing budget for next season but unfortunately some of the players who have been part of the journey this club has been on for the last few years will not be with us. I need to reinvigorate and refresh the squad. 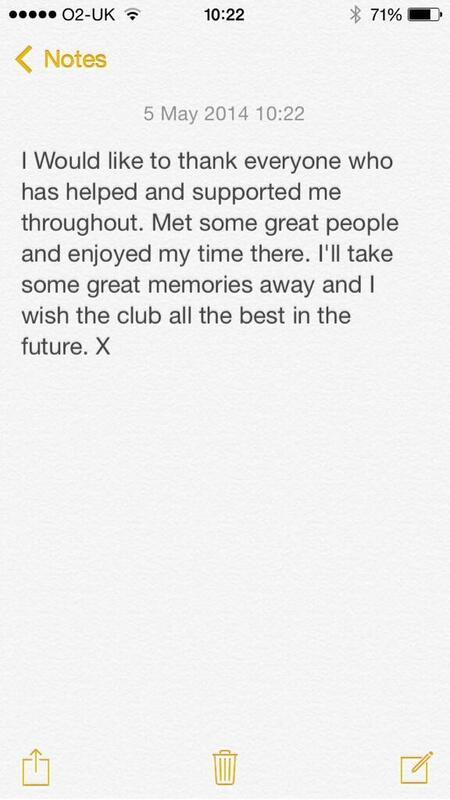 “On behalf of the club and the supporters, I would like to express my thanks to those players who are leaving us for their service to Crawley Town FC and wish them all the best for their futures. “The job of re-shaping the squad and the back room team for next season is underway. Looks to me that JG has it pretty much spot on. With Fadz, Walsh, Drury, Simpson and hopefully Bully re-signing that is the core of a decent squad. Time will tell whether the others accept, if not we will replace them. It will be interesting to see what happens with Jamie Proctor, as he is under 24 we would presumably be entitled to some money for him depending on what he was offered. I would like to see Dannie Bulman offered some type of player/coach role, with a Whittingham gone it would probably help JG and I'm sure the younger players could learn from him. Shocked Clarke, M. Connolly and P. Jones have not been offered. As said above, can only be money. Yes but Swindons squad is in excess of thirty players they have retained twenty players plus players .Not sure what it proves but they ain't undergoing a clear out on our proportions. So at this moment in time we have a squad of 7 for next season and 2 of those are "young scholar" players. 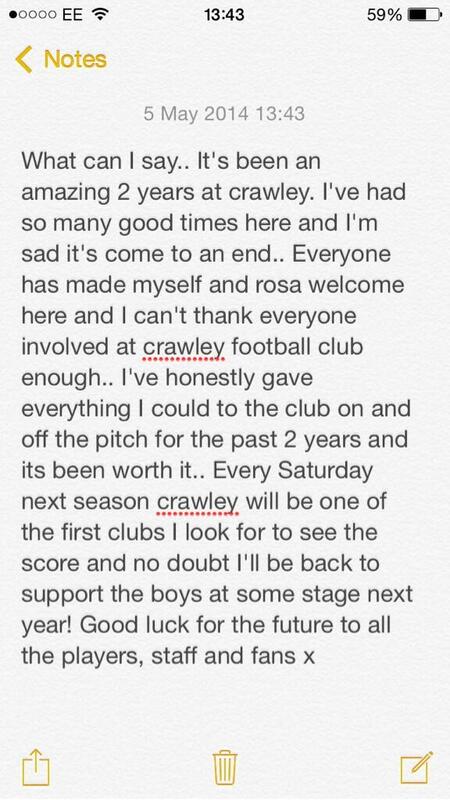 We're certainly not Big Spending Crawley anymore. Given that we can't afford to keep three of our best players I has to be Operation Survival next season. Hopefully Bulman, Sadler, Proctor and M. Jones will sign up and we can get Edwards and Tubbs on board but the outlook remains pretty bleak. Well it is a concern but, as I've previously stated, many other clubs are in similar positions. Perhaps a general lowering of standards and/or wages below Championship level is looming. It's no different to what the wider economy has been experiencing really. Football isn't immune. Long term, I think it's probably a good thing for clubs as the FPP will reduce the number going bust. However, anyone with opportunities other than becoming a pro footballer are perhaps more likely to be lost to the game. Money is tight but in the cold light of day I'm not that shocked. Paul Jones - great shot stopper but made a few mistakes and doesn't come off his line. Plus kicking not great. Mark Connolly - loses out as we have 3 x CBs on contract and JG may be looking for a more experienced RB. Billy Clarke - talented lad but always has to faff around to get it on the left foot and drifted out of far too many games. TBH I think Billy will do well at a better club where he can be a playmaker . I'm sure we will be able to replace them. For example I would have Edwards ahead of Clarke any day. Agreed on most of your points above. Connolly and Clarke are good and proven players at this level but hardly world beaters. Jones though - whilst having made a couple of errors - is one of the better goalkeepers in this division and one who I think could genuinely make the step up. It's ok saying there are better - that I agree with - but it'll be hard attracting them to a small club with no money. At least these three players could cut it. I'm not panicking yet I really do think this season will be a struggle. A couple of players have taken to Twitter following the release of the list this morning.